Powers/Abilities: A symbiotic alien, Bizarnage has the ability to graft onto human hosts in a process he likes to call "Bizarnagizing". His alien physiology enables him to easily avoid most projectiles and physical attacks. Although Bizarnage's intelligence is quite low, his crazed cunning makes him an unpredictable and nearly unstoppable foe. Bizarnage's twisted obsession with Spider-Boy (Pete Ross) is often the key to his undoing. 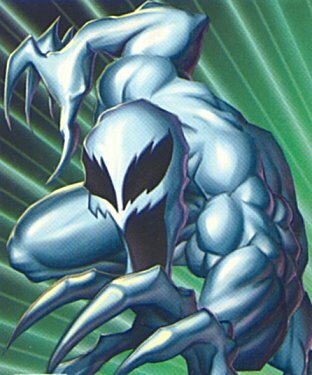 (The Outrageous Spider-Boy#254) - The nightmarish, crystalline symbiote known as Bizarnage was the disastrous result of Project Cadmus' attempt to synthetically replicate alien DNA. 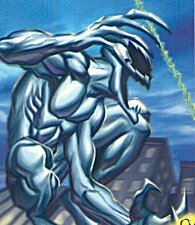 Tragically, the albino abomination burst free from his embryo-tube birthplace and wreaked havoc throughout Project Cadmus -- oozing and slicing through everything and everyone . . . that is, until Spider-Boy (Pete Ross) saved the day. (Way-Cool Spider-Boy #37) - Reed "Prof" Richards, Project Cadmus' Cheif Scientist, afflicted by the "evil" DNA that rival scientist Dabney Donovan had been secretly adding to his diet, set Bizarnage free from Cadmus' menagerie in an act of sabotage. Bizarnage grafted onto Challenger of the Fantastic member Johnny "Red" Storm and began running amok through the genetic research facilities of Project Cadmus, knocking Cadmus' power grid offline in the process.. Luckily, Spider-Boy arrived on the scene to protect the Cadmus scientists from the deranged D.N.Alien bent on death and destruction. (Spider-Boy#1) - "Big Trouble!" The battle between Bizarnage and Spider-Boy continued in the genetic research facilities of Project Cadmus. Bizarnage wanted to be Spider-Boy, but rationalized that (since there can only be one Spider-Boy) he would have to kill the original Arach-Kid. After successfully dodging the webbing from Spider-Boy's Web-Shooter, Bizarnage attacked Cadmus Director Tom Harper (formerly the World War II hero known as the Guardian Angel) and attempted to graft onto him so that Bizarnage could become the Cadmus "big boss." But before Bizarnage could graft onto Tom Harper, Spider-Boy lured him away by promising not to move. Bizarnage took the bait and separated from Johnny "Red" Storm so that he could instead graft onto Spider-Boy. 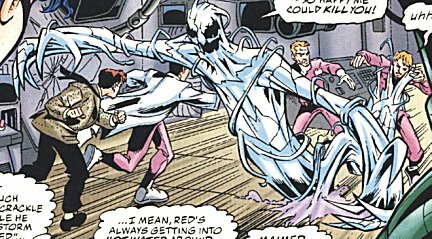 As the Bizarnage symbiote slithered across the floor toward Spider-Boy, the Arach-Kid fired his Web-Shooter at a button that activated the door to one of Cadmus' Energy Containment Cells. The unsuspecting Bizarnage was sucked through the door and imprisoned within the Energy Containment Cell. THE OUTRAGEOUS SPIDER-BOY is an amalgam of Marvel's AMAZING SPIDER-MAN, DC's ACTION COMICS (DC's Bizarro debuted in ACTION COMICS#254), and DC's SUPERBOY.